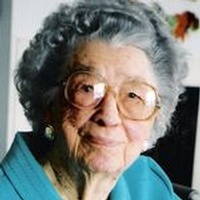 Diana Wornom Acree, the last of 7 siblings born to John Gibbs and Diana Wornom, died December 7, 2006, three days short of her 100th birthday. She was a lifelong resident of Poquoson, VA. Preceded in death by her parents, John and Diana Wornom; a son, Donald Acree; and her husband, Ira Hugh Acree. She is survived by her son, Irvin Acree and wife, Annette, of Poquoson; her daughter, Diane Acree Helbing and husband, Tom, of Vienna, VA; six grandchildren, James Acree and wife, Anne, Alan Acree and wife, Evelyn, Steve Acree, Don Acree, Scott Helbing and wife, Lindsay, Stacy Helbing; and 14 great-grandchildren. Mrs. Acree was a lifelong member of Emmaus Baptist Church, active in Sunday School, Women's Missionary Union, served on various committees, and attended Sunday School and worship up until the time of her death. Graduating from Mary Washington after two years with a teacher's certificate, she taught school in Dare, VA, and Machapongo on the eastern shore. When she married Hugh Acree in October of 1931, she could no longer teach in public schools by law. Church was the center of her life, but she also enjoyed writing poetry and continued an avid interest in working the Jumbles in the Daily Press. The family would like to thank Jim and Anne for taking our mother into their home in August of 2005 and caring for her in a loving and personal way until her death on Thursday. The family will receive friends Friday, 7-8:30 PM, at Claytor Rollins Funeral Home, and other times at 42 Pasture Road. A graveside service will be held Saturday, 10:00 AM, at Providence Methodist Church Cemetery by Dr. John Snow. A service of celebration for the life of Mrs. Diana Acree will be at 11:00 AM, at Emmaus Baptist Church by Dr. John Snow, Dr. Irvin Acree, Pastor Jimmy Acree and Pastor Alan Acree. Memorial donations may be made to Emmaus Baptist Church, the Bacon's Castle Baptist Church, or to your favorite charity.